Not to be confused with "Vito," the representative from North Idaho. 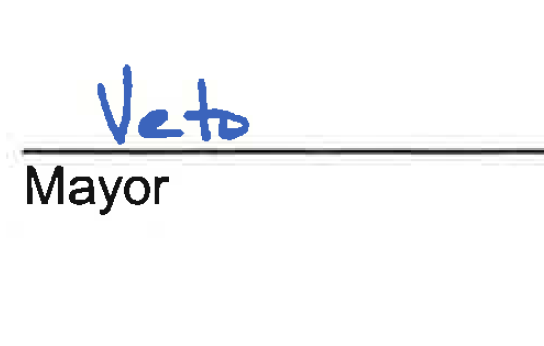 It's not often that Mayor David Condon uncaps his pen and writes the word "veto" over a council ordinance. After all, the 6-1 liberal majority on council can easily override him if they so choose. But on the Spokane City Council's latest transit ordinance, he's gone and done it. The ordinance, passed 6-1 on April 11, allowed Transportation Benefit District funds — currently funded through car tabs — to be used in the future to fund transit projects, like bus routes. The bill's sponsor, Councilwoman Amber Waldref, was very clear that she did not intend to move funds currently being used for street projects to transit projects, or to fund transit projects with car tabs. Instead, she suggested the council would use the flexibility to ask voters for a sales tax increase to help fund the $4.1 million annual cost of operating the Central City Line, the proposed high-frequency electric bus route between Browne's Addition and Spokane Community College. But on Thursday, the STA board chose to put a measure on the Spokane County ballot this November asking voters to fund, among many other projects, the operation of the Central City Line. It will be almost identical to a measure voters had earlier rejected by razor thin margins, except STA is asking for a bit of a smaller tax hike. With this already on the ballot, Waldref announced Thursday that the council would no longer need to ask the City of Spokane voters to "go it alone" and fund the Central City Line themselves. “With today’s decision by the STA board to place a ballot measure before voters in November, I do not believe there is a need for the City Council to pursue a city-only transit option at this time,” she wrote. So on Friday, the mayor vetoed the ordinance. "Spokane transit has long been, and must remain, a regional effort," he wrote, arguing that the STA board's decision had made the decision to expand the TBD to include transit unnecessary. Mayoral vetoes have been relatively rare over the years, with the Inlander cataloging only eight major vetoes between 2001 — after the strong mayor system introduced the veto power— to 2014, when the mayor vetoed a bill concerning Urban Growth Areas. Since then, Condon has also vetoed an ordinance concerning motor homes and the ordinance mandating most private businesses provide earned sick leave for their employees. Those vetoes were quickly overridden. It is not yet clear if the council will override the mayor on this latest veto — and if they do, what message that would send about STA's ballot measure this fall.